The Show Answer button does not work for JS input problems. By default, the Show Answer option is set to Never. If you change this option in the problem component, a Show Answer button appears in the LMS, but the button does not work. In the component editor, modify the example code according to your problem. All problems have more than one element. Most problems conform to the same-origin policy (SOP), meaning that all elements have the same protocol, host, and port. For example, http://store.company.com:81/subdirectory_1/JSInputElement.html and http://store.company.com:81/subdirectory_2/JSInputElement.js have the same protocol (http), host (store.company.com), and port (81). If any elements of your problem use a different protocol, host, or port, you need to bypass the SOP. For example, https://info.company.com/JSInputElement2.html uses a different protocol, host, and port. To bypass the SOP, change sop="false" in line 8 of the example code to sop="true". For more information, see the same-origin policy page on the Mozilla Developer Network or on Wikipedia. If you want your problem to have a Save button, select Settings, and then set Maximum Attempts to a number larger than zero. To recreate the example problem above, you need the following files. To download these files in a .zip archive, go to http://files.edx.org/JSInput.zip. If you need to bypass the SOP, you also need the jschannel.js file, and your webGLDemo.html file will be slightly different. To download all of these files in a .zip archive, go to http://files.edx.org/JSInput_BypassSOP.zip. Download and unpackage the files in either the JSInput.zip file or the JSInput_BypassSOP.zip file. On the Files & Uploads page, upload all the files from the .zip file. Select Settings, and then set Maximum Attempts to a number larger than zero. In the problem component editor, replace the example code with the code below. In the image below, click the cone. par is a dictionary containing two keys, "answer" and "state"
When you create this problem, keep the following in mind. WebGLDemo.getState and WebGLDemo.setState are optional. You only have to define these functions if you want to conserve the state of the problem. Width and height represent the dimensions of the iframe that holds the application. 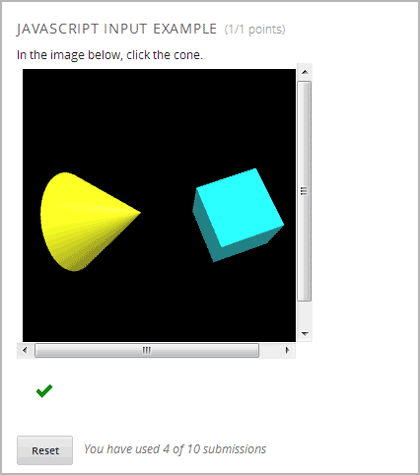 When the problem opens, the cone and the cube are both blue, or “unselected.” When you click either shape once, the shape becomes yellow, or “selected.” To unselect the shape, click it again. Continue clicking the shape to select and unselect it. The response is graded as correct if the cone is selected (yellow) when the user selects Check. Selecting Check or Save registers the problem’s current state. A JSInput exercise creates an iframe in a static HTML page, and passes the return value of author-specified functions to the enclosing response type (generally CustomResponse). JSInput can also store and retrieve state. The gradefn attribute specifies the name of the function that will be called when a user selects Check, and that returns the learner’s answer. Unless both the get_statefn and set_statefn attributes are also used, this answer is passed as a string to the enclosing response type. In the customresponse example above, this means cfn will be passed this answer as ans. In the future, JSInput may attempt to make these dimensions match the HTML file’s dimensions (up to the aforementioned limits), but currently it defaults to 500 and 400 for height and width, respectively.